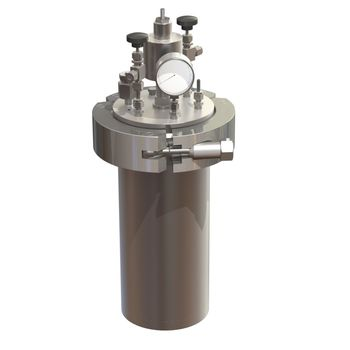 The RVDS series high pressure reactors are used for hydrogenation, polymerization, chemical synthesis, catalytic reactions under high pressure, synthesizing zeolites, nanoparticles, studying biofuel and biomass, as well as for testing various materials under pressures of up to 60 bar. The standard configuration of RVDS reactors with maximum allowable pressure of 60 bar at 250°C allows to carry out the majority of chemical reactions in laboratory conditions. RVDS reactors are available in volumes of 1,000 ml, 2,000 ml, 3,000 ml and 5,000 ml. 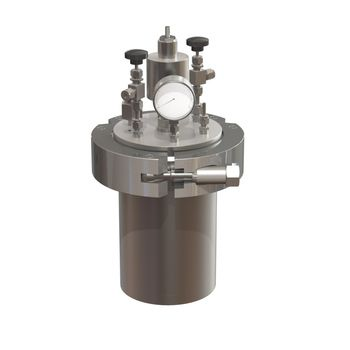 The lid of RVDS reactors is equipped with six ports and all the necessary fittings: a 200 bar pressure gauge, a safety membrane, two needle valves, and immersion well to measure temperature inside the reactor. RVDS reactors are equipped with a fast locking and sealing system, which accelerates loading, unloading and cleaning of the device. All RVDS reactors are made from AISI 316L stainless steel. PTFE inserts and lid covers are available for work in aggressive media. RVDS reactors can also be supplied with a glass insert for comfortable withdrawal of products from the reactor. A magnetic drive and a two-bladed PTFE stirrer inside the reactor provide for effective mixing of a product or a medium, as well as excellent heat transfer. Reactors have an electric heater with a programmable controller. For large RVDS high pressure reactors, there is an option for additional heating or cooling. Custom-made reactors can be manufactured from AISI 316Ti or Hastelloy S-276, as well as with operating temperatures exceeding 250°C.